The original has now been remastered and comes with plenty of re-imagined and revamped content. 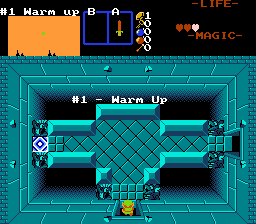 Comes complete with typical and non-typical Zelda 1 game-play, odd secrets and decent mini dungeons. 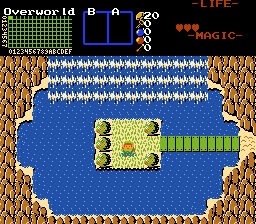 A standard Zelda 1 scenario, a missing princess, kidnapped by a warlock boar, and a travelling hero who needs to gain strength to complete his duty. 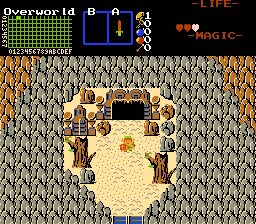 Link has saved the people so many times that he built an altar at a waterfall to remember his deeds. The winds blow once again carrying the voice of an all-too familiar scenario... A princess being kidnapped by a power hungry warlock boar. With nothing but his old armor, Link sets off to gain the strength needed to save the princess once again. Fixed a continue bug having to do with the waterfall cave. Level 4 cheat is your friend if you get stuck in a wall anymore. Typical Level 1-4 cheats are default I believe, dont really care to disable them. Total of 20 Hearts ~ Start with 3 Hearts, Gain 8 Heart Containers from Bosses and gain 36 Heart Pieces to get to 20 total hearts. Red Ring is Best Ring, Friend of Level 9. Lens of Truth can be gained before Level 3 if you're bold enough. Hookshot isnt absolutely required, but helps. Fire Boomerang is not included. The Din, Nayru and Farore magics are considered late game things. Blue Ring can be obtained after Level 3. Mr.ReDead for building testing and submitting the quest. PureZC for hosting the quest. Makers of the Classic XD Tileset. Nintendo for the outstanding Original Legend of Zelda (NES). 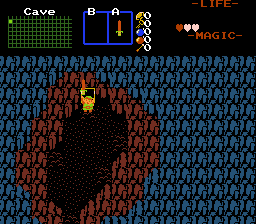 I got trapped in the top left corner in the waterfall cave from restarting and continuing. Now I can't get out. Does anyone know how to fix this without having to begin the game over again? Am I the only one not able to find the bracelet? I apparently need it for Lv 9, but I haven't been able to find it yet. I think I collected the L2 (Blue) Magic Ring from Level 1 before the L1 (Green? ), which I haven't found, if it exists. Am I in danger of finding the L1 in a chest somewhere and downgrading? I don't seem to be able to find the ladder in #3. I went and got the lens but I still can't seem to find anything that will let me pass over the gap of water in the southwest corner.